An elaborate fancy dress party with fabulous fancy dress costumes for the rich and famous. 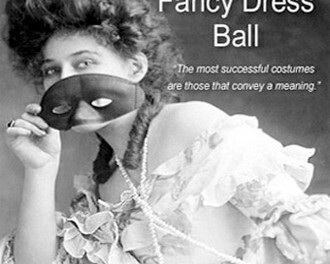 IT is very rarely the case that an entertainment is so widely talked about and so long and so eagerly anticipated as was this — a ball which had even invited a rumor so disagreeable, even so frightful, as that the Communists meant to attack the house and to sack it, with its immeasurable wealth of jewelry, bric-à-brac, silver and gold, and objects d’arts, on this eventful evening. It is seldom that such an entertainment goes off so serenely, without accident and without a single untoward event, as did Mrs. W. K. Vanderbilt’s ball of March 26,1883. Evening gowns of the mid-1840s were worn off the shoulder and featured short tight sleeves with either puff decorations or lace trimming. Featuring clothing worn by Queen Victoria’s children Princess Beatrice, Princess Alice and Prince Leopold. 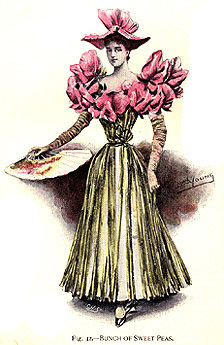 A necessity for the 1880s Victorian style dress was a well-fitting bustle.